A couple years ago we planted several (a dozen?) habanero plants. They produced plentifully! Delicious light-green, yellow, and bright orange habanero peppers. They are picante! (They kinda hurt!) 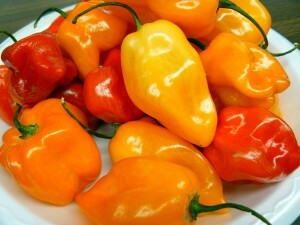 With so much abundance, I searched for a hot sauce recipe using habaneros and found this one below. (Slightly modified by me.) It’s hot, but the carrots help offset the heat, and maintain the good habanero flavor. One modification I made was to add the jalapeño flavor. We had an even greater abundance of that pepper, so I added them in. An equal amount, or slightly more. The result? A fantastically hot/spicy sauce that has great flavor, and lasted many months in the fridge. Love it! In a large skillet, saute the onion and garlic in oil until soft. Add carrots and water and bring to a boil. Reduce heat and simmer until carrots are soft. Remove from heat and transfer to a blender or food processor. Add the peppers, lime juice, vinegar and salt. Puree until smooth. Return mixture to skillet and saute for a few more minutes, this gives the sauce a more liquid consistency. Store in a sealed jar in your fridge. Sauce can last for many months—unless you use it all first!